The David and Gladys Wright House has been saved! 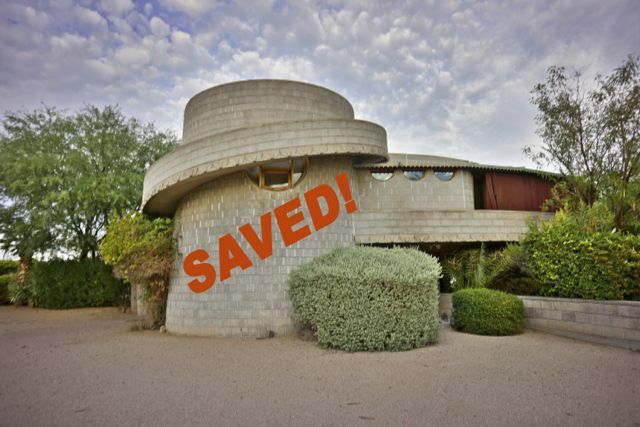 Jarson & Jarson/azarchitecture.com is happy to announce that a generous anonymous benefactor stepped forward and has purchased this significant and endangered home. In anticipation of the formation of a Non-Profit that will conserve the house, the new owner, working in concert with the Frank Lloyd Wright Building Conservancy, quietly contracted the property the week of December 11th. The sale is scheduled to be completed today. The Buyer intends to transfer the home to a newly formed not-for-profit organization empowered to raise funds sufficient to restore and manage the home. The new owner shall seek Landmark Status designation from the City of Phoenix. This is a joyous event for our community in that it is the successful culmination of a long series of impassioned events. There are many heroes here, first and foremost the new owner, yet each and every person that was moved to share their time, support, commentary and efforts to move this home forward have been fundamental in helping to create the successful outcome we can announce today. We must continue to support this home as it will be the measure of all such future endeavors. Many have been skeptical of the ability of our community in furthering preservation in general, we can now show the depth of such commitment. The cultural value of this home was questioned. Today, that question has been answered!